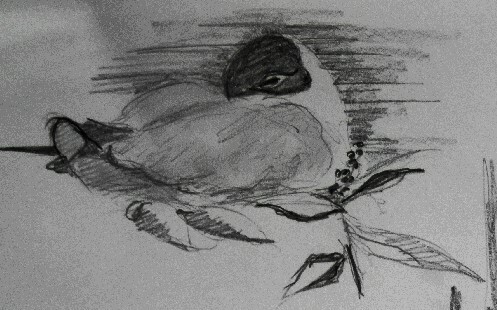 The sketch should focus not on birds alone but derive its energy from the underlying rocks and surrounding atmosphere. This place, Bass Rock, is a basaltic plug, the core of an ancient volcano thrust up into what is now a shallow sea. 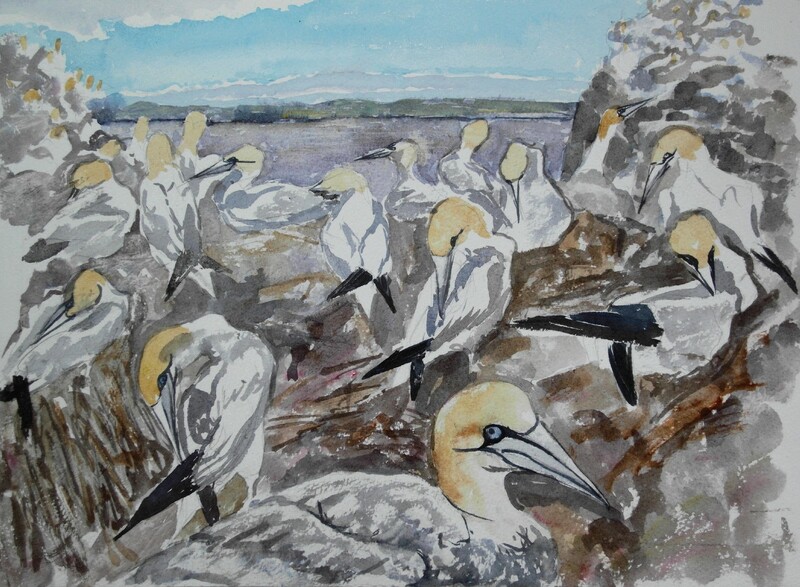 The many thousands of gannets who come here each year to breed, the predatory gulls looking to steal an egg, are mere décor on this venerable surface. Breeding colony of gannets on Bass Rock, Scotland. This paraphrases the guidance from John Busby who brings to this subject both breadth and depth of artistic understanding. 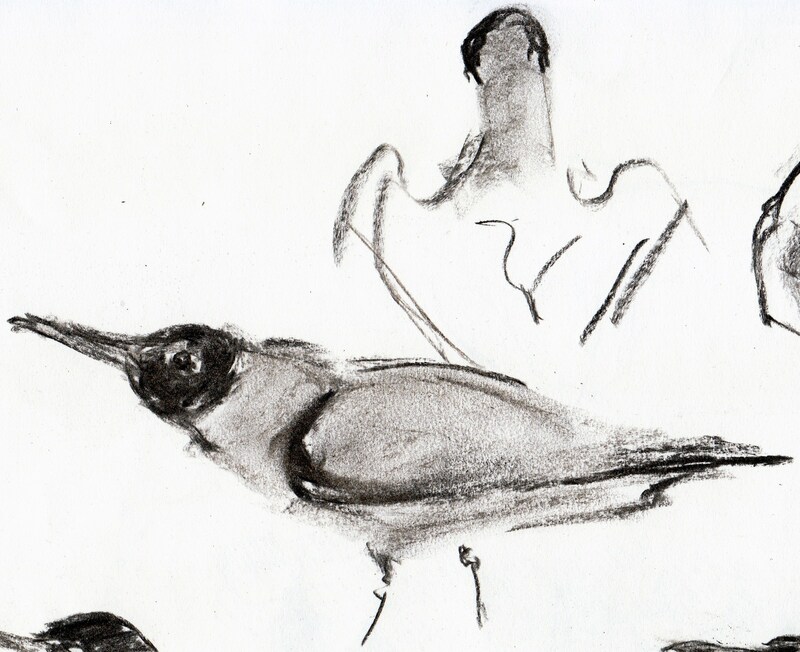 Both scientifically and artistically, we have to draw in the surroundings to animate the bird. 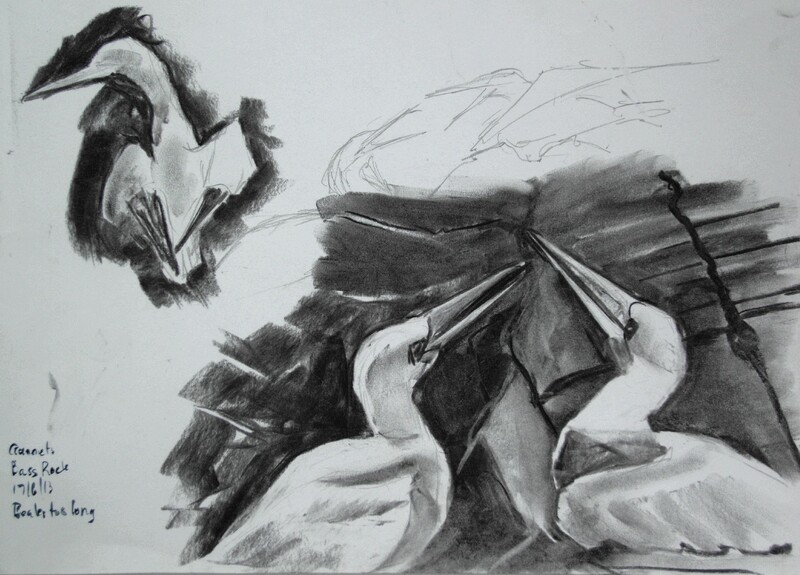 Charcoal sketches of gannets against the underlying limed granite. 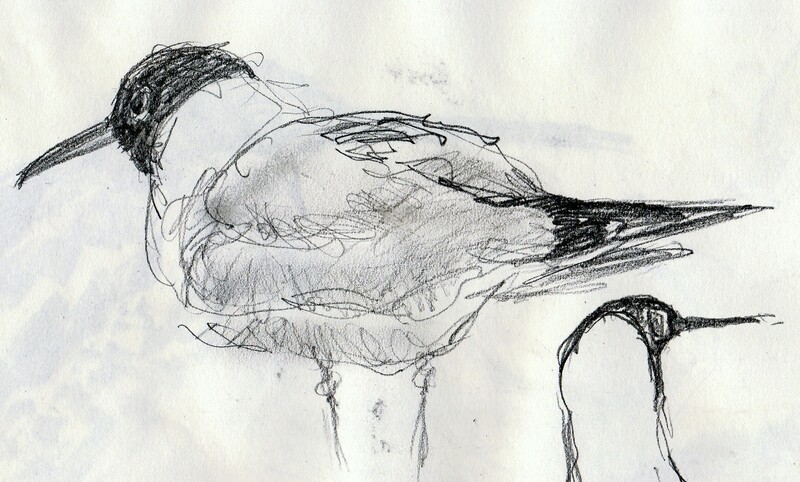 Sitting surrounded by these large birds, overwhelmed by their noise and smell, it is hard to escape their essential beakiness. This is what grabs the eye, literally if they were given the chance. How long is a gannet’s beak? This one has morphed into a Malibou stork. 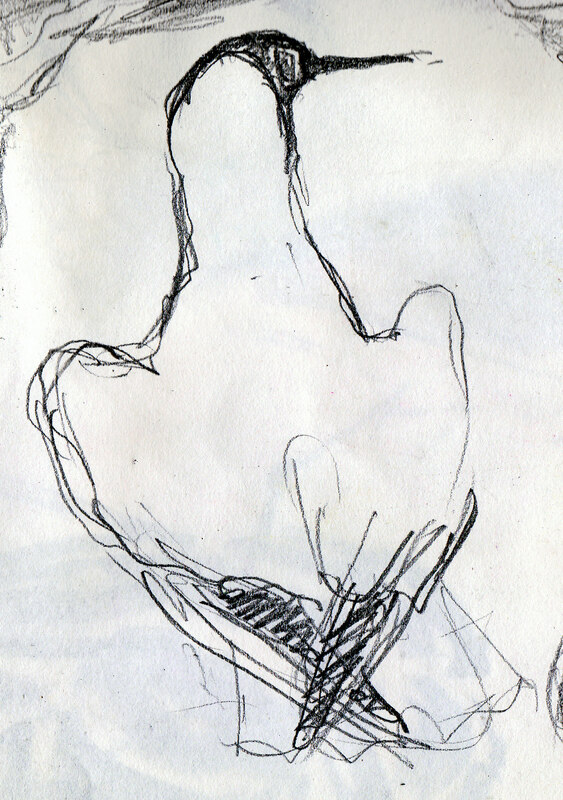 This is a fundamental error in draughtsmanship. 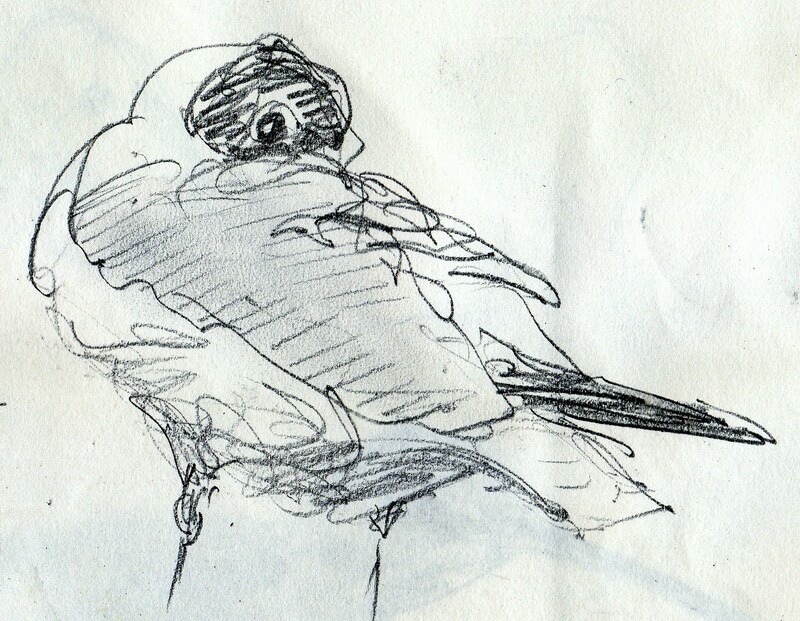 The beak is closer to the length of the head. 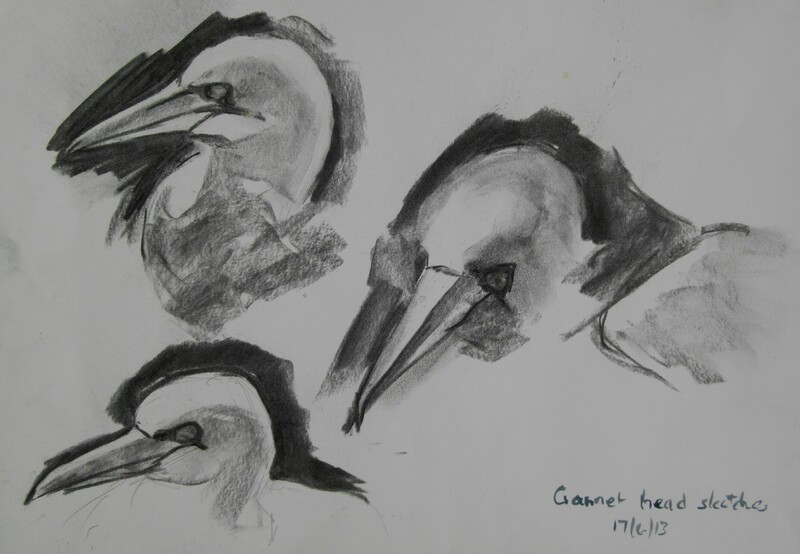 Capturing the shape of the gannet’s head. The watercolour headlining this post was painted at the end of this first day, an attempt to decorate the rock with the nesting birds preening, displaying, defending their sites. At home, I reworked this to get a more striking balance of tones and colours and added the many other gannets careening through the air. 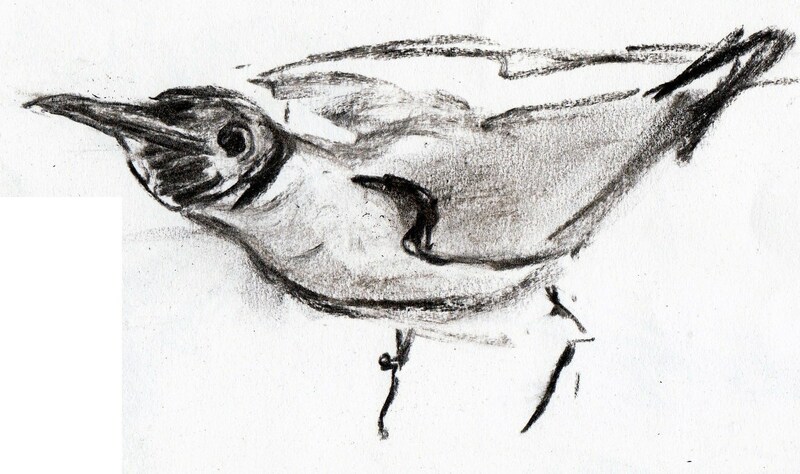 Reflecting further, were we to imagine the landscape looking back at us, the distinction between gannet and sapient ape would be trivial, both minor variations on that recent innovation, the walking fish. What links us, aerobic metabolism, quadrapedal morphology and the rest is greater than what divides us. 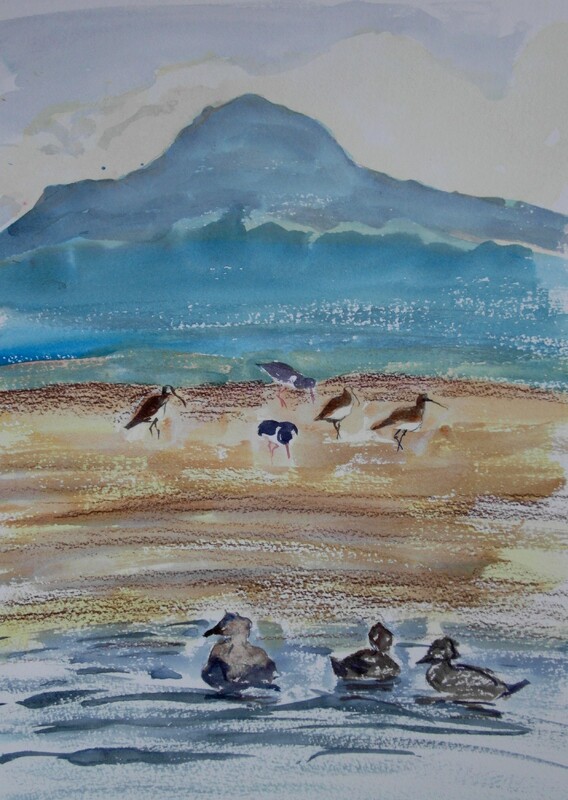 But neither ape nor bird are mere superficial dots, for both carry forward that metabolic drive, that spark of fire that first ignited in submarine fumaroles long before the Bass Rock volcano exploded and that has shaped this planet as profoundly as any other force. 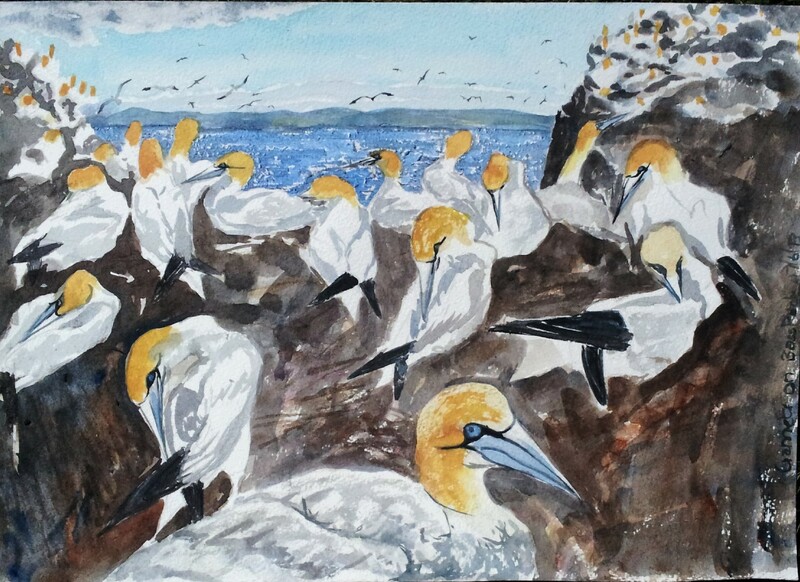 My previous post was painted the evening before the start of the five-day Seabird Painting Course. 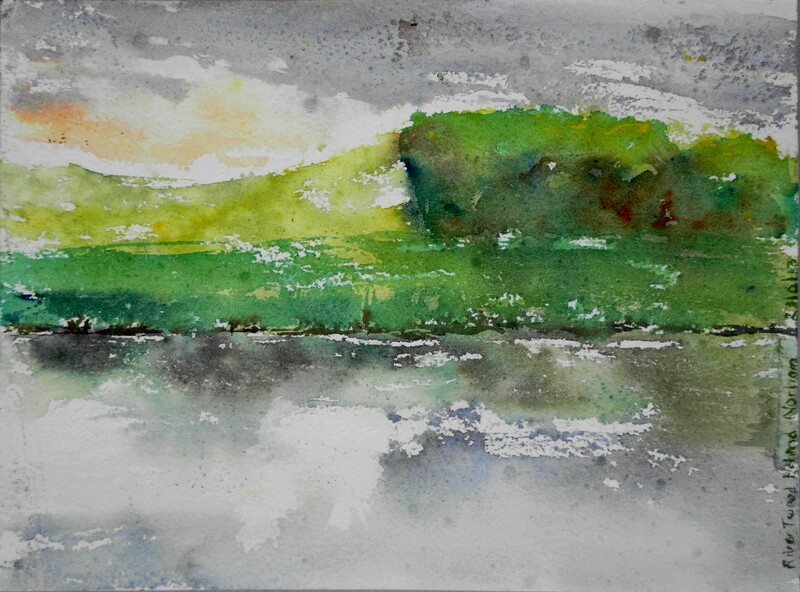 This next piece marks its end, painted from the English side of the border looking across the River Tweed to a Scottish woodland, the morning I set off for home. No masterpiece I know, but it combines much that makes painting pleasurable for me. It is loose and a little abstracted. It was painted directly in under ten minutes, against the elements, with me standing only part sheltered from rain beneath a tree. The falling water kept the paper damp and moved the pigments: the trick was to stop before all turned to mud. Later, when the paper had dried, I placed a single additional layer of paint to strengthen the grass and woodland and the mud water margin. 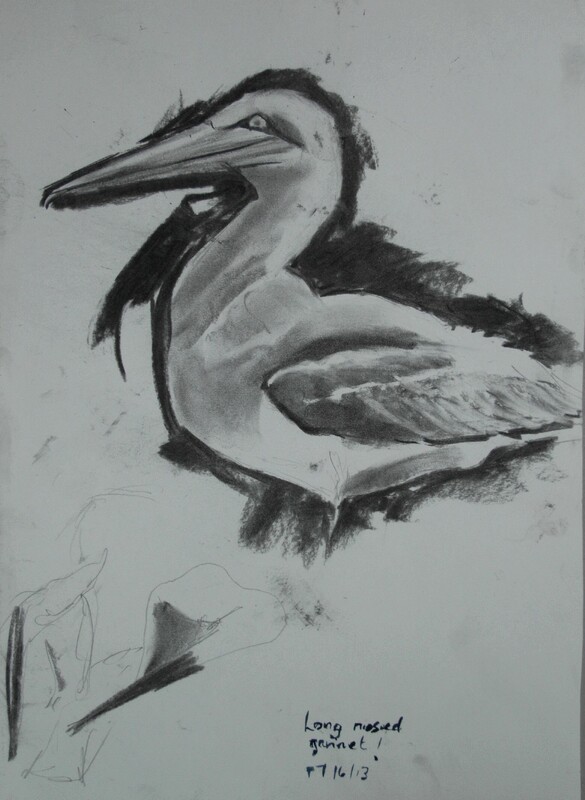 The Seabird Painting Course is a long-running annual event, founded and led by the great wildlife artist, John Busby. I had been once before but still, this year, found it an remarkably challenging. There is fabulous guidance and support, not just from the four tutors but from the twenty or so other students, an accomplished and diverse group. However, the settings remain overwhelming – I could never decide whether to obsess over anatomical minutiae, capture movement and drama or paint the big picture. 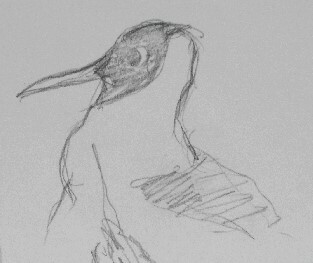 In the next series of posts I will set out my sketches with my reflections. Though this blog is open to public consumption, this is primarily for my own benefit – to consolidate something of what I have learned. 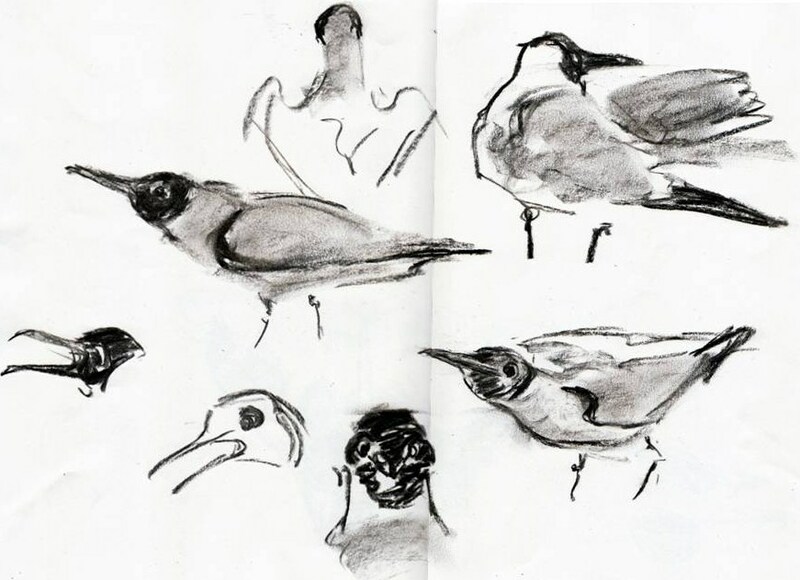 In the evening, at Aberlady estuary, at a distance and viewed through a telescope, groups of probing curlews and oystercatchers stood out on the sandbank, contrasting with the blue distant hills. This is how the RSBP website describes the greylag goose. They are common on any water in England and are the ancestor the domesticated goose. Excuse me, but if you can count Velociraptor among your relatives, you retain a certain dignity. 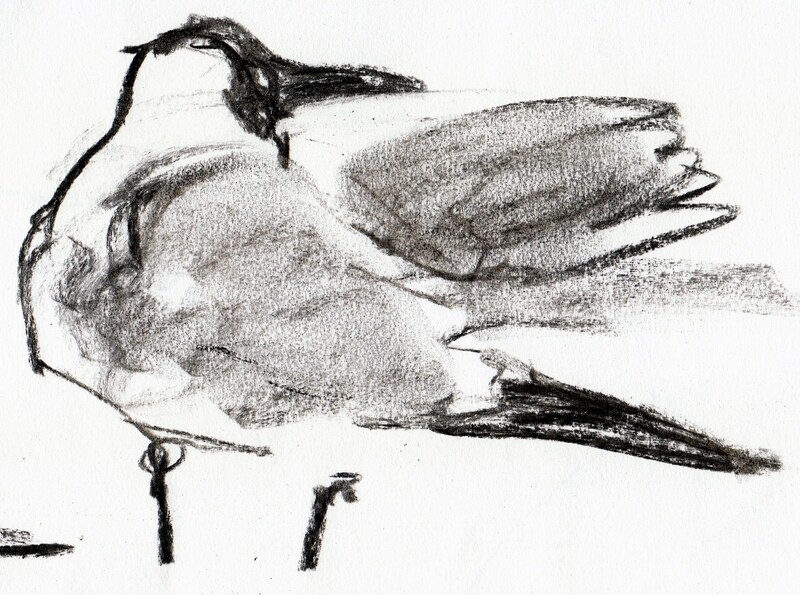 Until I started watching, I never saw Black Headed Gulls. Now I can see them, I see them everywhere on any open water. They bob on the surface, like balancing bananas. To my eyes, they wear an expression of bemused surprise. 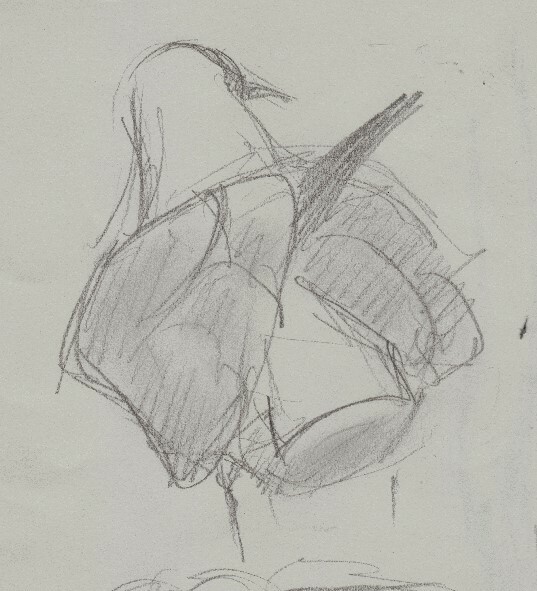 In April, they court, dropping their heads and arching their necks downwards, half opening their wings making a heart shape when viewed from behind. Now the colony is guarding and feeding the stumbling chicks. 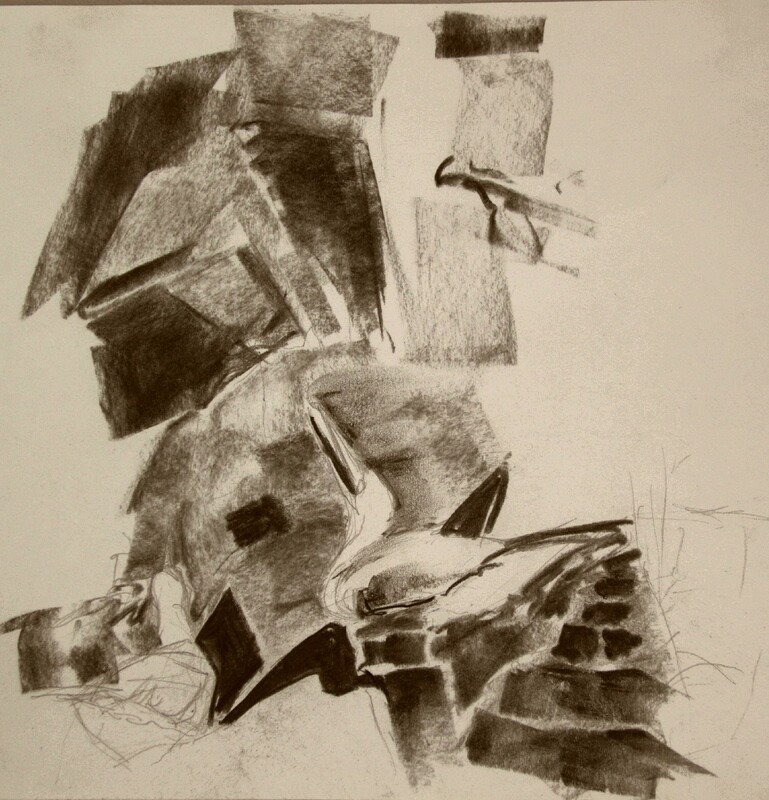 This is a collection of graphite sketches over the past few weeks. When I chanced upon and illustrated this ballet clip, I was already thinking about courtship through dance. 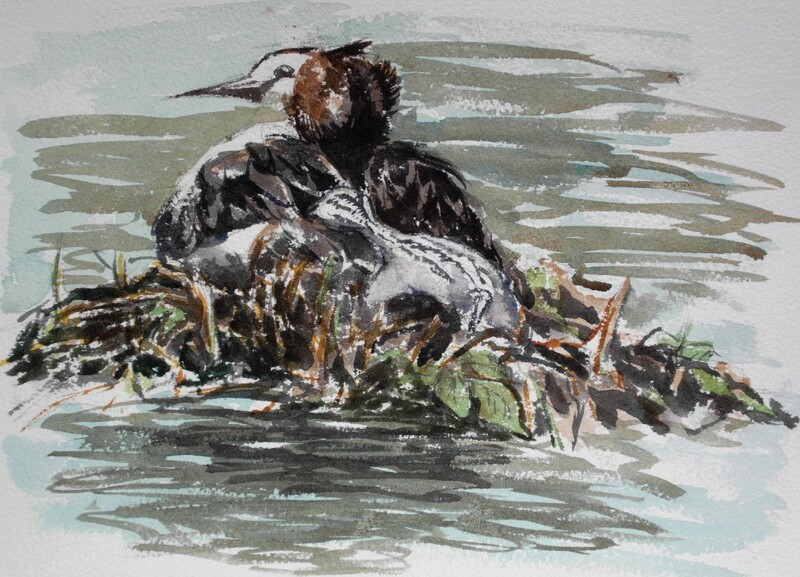 In late April I observed the final act of the ritual between a pair of mating grebes, but looking at the birding websites, I think the dancing had gone on through March. 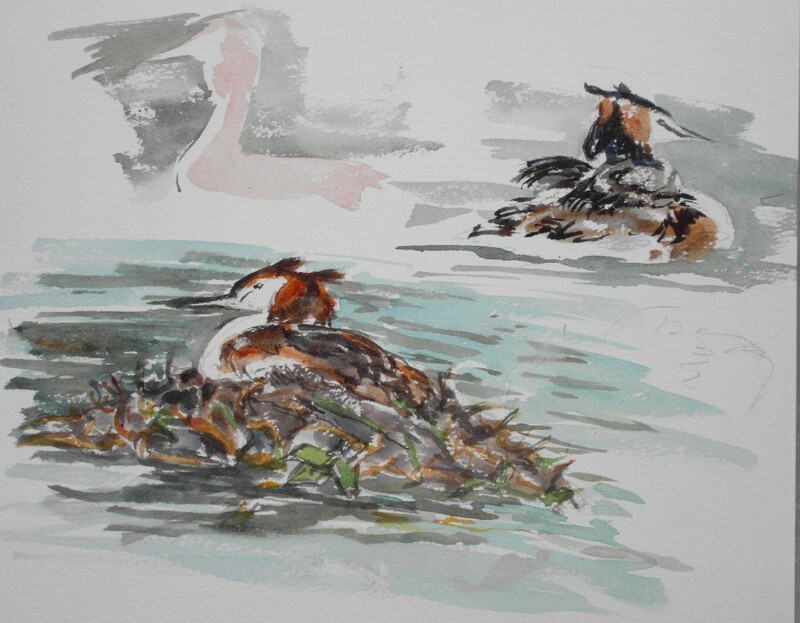 A couple of weeks ago, I found myself opposite a grebe nest with two chicks and remaining eggs unhatched. The male returned periodically and fed the chicks with feathers. In so far as I can tell, this serves as a stomach lining, protecting against the sharp chitinous exoskeletons in the infant diet. 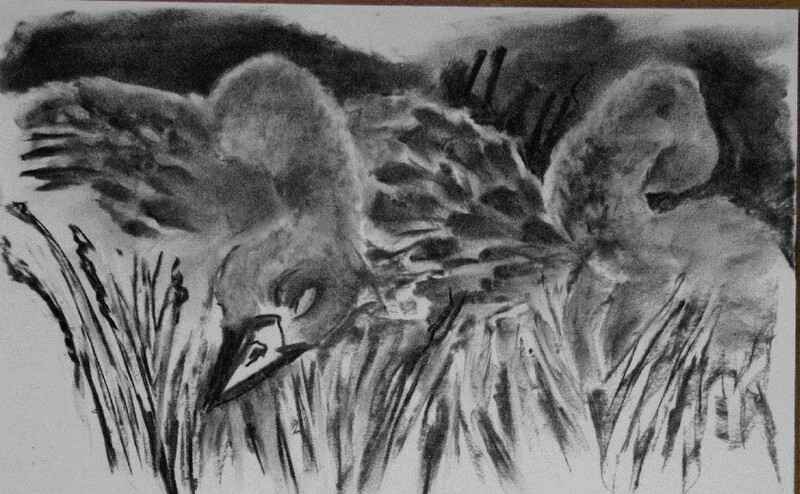 The chicks took frequent outings on the mother’s back or struggled to hide beneath her wings when she was sitting. The following week, they had all moved on. 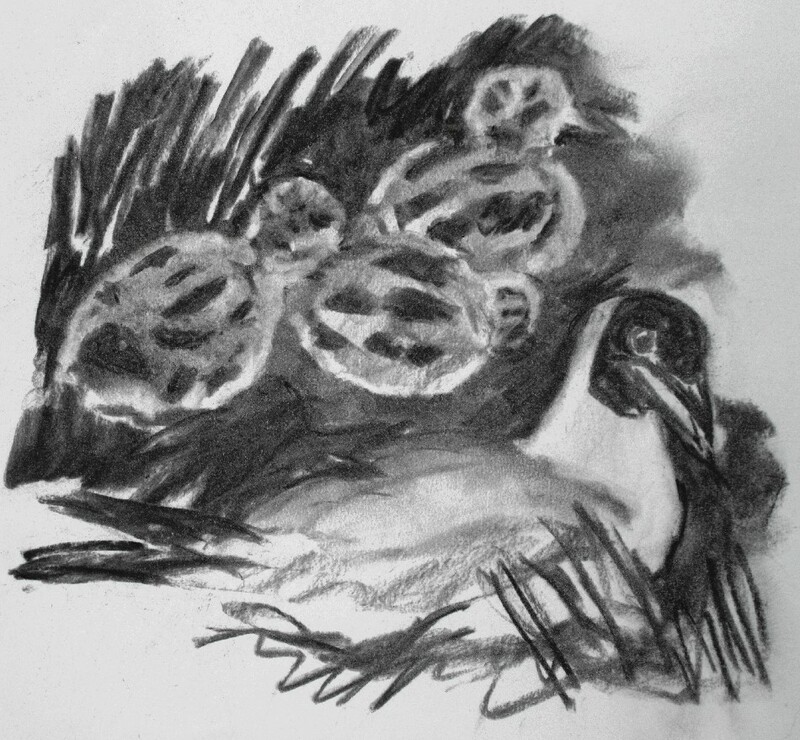 I have illustrated grebes previously.